This month, we're going to talk about how to calculate your net worth. This may sound intimidating, but it's actually fairly simple and extremely important to your overall financial well-being. Your net worth consists of two parts: assets and liabilities. Assets are property owned by a person, regarded as having value and available to meet debts. Liabilities are the state of being responsible for something, especially a debit or financial obligation. You'll begin by listing all of the assets you own and then adding them together. Then, you will list your liabilities and do the same thing. Once you have these two numbers, subtract your liabilities from you assets. This final number is your net worth. If your assets outweigh your liabilities, you have a positive net worth. If your liabilities exceed your assets, you have a negative net worth. Just remember that when you calculate your net worth, it's merely a photograph in time. It's important to regularly update your information, at least once a year, so you have your most accurate financial data at all times. WHY SHOULD I CALCULATE MY NETWORTH? Below, you'll find a guide to help you calculate your net worth. 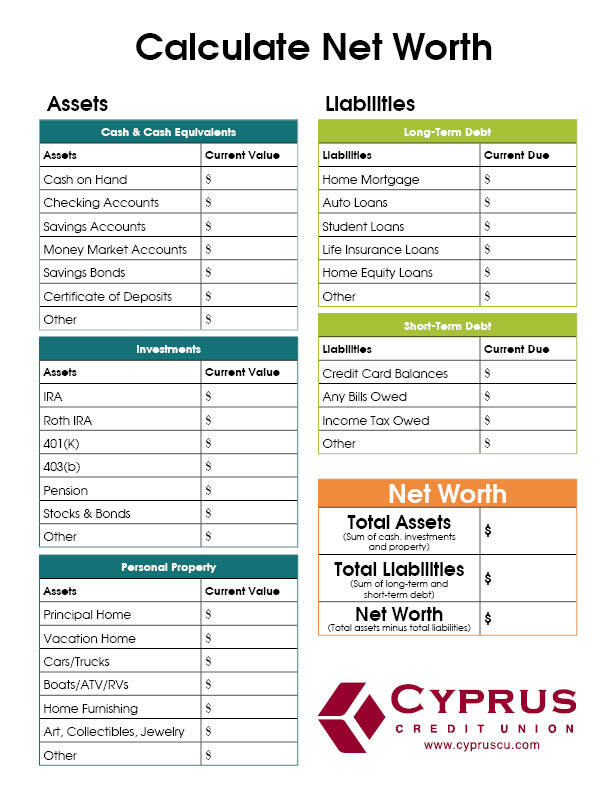 Click HERE to print out your own net worth sheet.